Hi Friends: Today's post is a thank you card. I really enjoyed making this card & hope you like it, too. See below for instructions, challenges, etc. Have a super day! I started with a 4X5.5 panel of plain white card-stock and stamped my floral images using Archival Jet Black ink. I also stamped 3 of the smaller images onto scrap white card-stock. 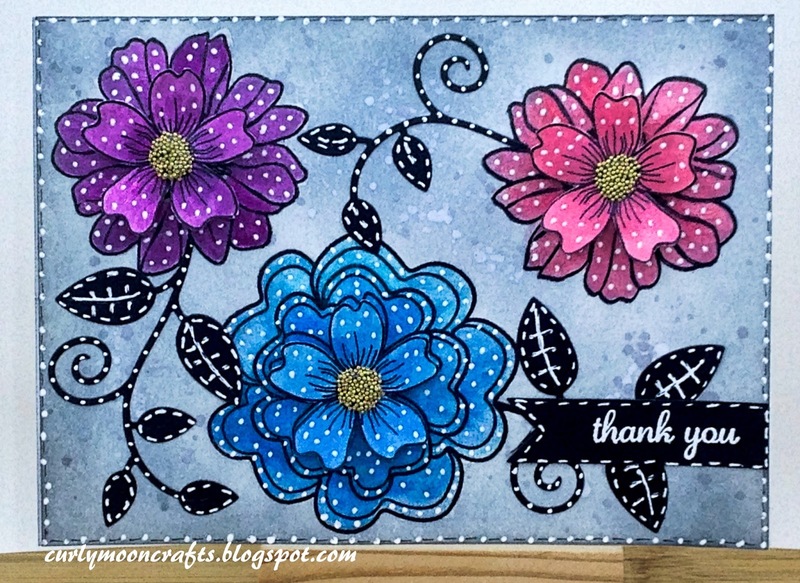 I colored all of the flowers with the below colors of LSG Magicals - I just love painting with this shimmery medium. I fussy cut the smaller images for layering. I covered the flowers with Distress Collage Medium, as a resist, so that I could color the background card-stock with Distress Weathered Wood ink. I glued the panel to a card blank, then edged the card with Hickory Smoke ink, and sprinkled some water droplets and Hickory Smoke ink droplets on the card. I layered the smaller flowers in the center of the larger flowers, using pop-dots. I used Glossy Accents in the center of the flowers, then sprinkled them with gold tiny glass beads. I die cut the Swirly Vine die from black card-stock, cut it into 3 sections, and glued it between the flowers. I added a Thank You sentiment that was stamped onto black card-stock with Versamark Ink, then heat embossed with white embossing powder. I finished off with some faux stitching around the card, and dots around all the flowers & vines. hello patti! this is precious! I am so glad you played along with us at simon says stamp wednesday challenge!